This stadium really is worth a day out!!! 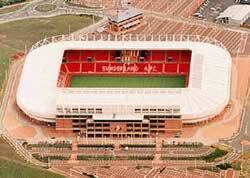 It was recently voted 'Best Stadium in England' by Total football magazine, and you can see why. The ground has obviously been designed with the supporters in mind, and the facilities are good, and above all respected by the fans. This makes for a clean, tidy, and modern stadium. The stadium has a quarter of a mile of bars around the concourse, but you wouldn't think so when you're trying to get a pint at half time! A half time trip to the toilet isn't too much fun either! The capacity is currently 48,000, but preliminary planning permission has been granted to extend the south stand, raising the capacity to approx. 54,000, with the boards finally goal being a stadium that will host approx. 63,000. We can not really say any more about this stadium... If you have not already been, then GO! Exit the A1 at the A690 Durham/Sunderland exit. After approx 4 miles turn left onto the A19 (signposted Tyne Tunnel), Keep in the left hand lane and take the slip road signposted Washington/Sunderland onto the bridge over the river Wear. Turn right onto the A1231 (signposted Washington/Sunderland) stay on this road going straight through 4 roundabouts in to Sunderland. Continue straight through 3 sets of traffic lights and the stadium car park is on the right about half a mile past the traffic lights. The ground is a 15 minute walk from the station. Exit the station between the WHSmith and the bakery, turn left and walk down High Street West. Turn left again into Fawcett Street. This leads to the Wear Bridge. Cross the bridge, and turn left into Millennium Way. You can't miss the ground from here. Dave from Ipswich says 'We parked in the St Marys car park, just across the river (south side) from the ground. It has been declared one of the safest car parks in Europe. It is on the ring road for easy access to and from the ground, which is only 10 mins away.' We understand that you do need to be there early to get into the car park though. A good pub to recommend is Sinatras which is the next pub along from Yates, the next pub along from Sinatras is Bar 36 which is ok but might be a bit dodgy for away fans, but only open after Saturday matches. This is a class pub near to the Bus Station with a great juke box with a lot of Punk records available. A big screen is also brought down for live games. The social clubs on Newcastle Road are also worth checking out as all have an admittance fee of 20p on match days and cheap pints, but it could be a bit dodgy for away fans. Strippers on Match day! So probably not a family friendly choice and no team colours. Our reviewers pre match choice - located in the city centre, with excellent Guinness. Located about 10 mins walk away from the ground in Southwick. Its in a rough area but home fans are always welcoming and the banter is good. A small bar but ok for a pint either before or after the match. Sky TV available, pool table and jukebox. If you are a registered user then you can login, and create your own personal review of Sunderland Football Club - The Stadium of Light. These reviews can be private or public.